Two of Sony's hotly anticipated devices have been announced at IFA 2013 in Berlin: the Xperia Z1 flagship Android smartphone, and the Cyber-shot QX10 and QX100 camera accessories. Both products up the ante in the mobile photography arena, and will surely give the Nokia Lumia 1020 a run for its money. Starting with the Xperia Z1, the new flagship comes with a 5-inch 1080p 'Triluminous' LCD display, and a Qualcomm Snapdragon 800 SoC under the hood, featuring a 2.2 GHz quad-core Krait 400 CPU and Adreno 330 GPU. There's also 2 GB of RAM inside, as well as 16 GB of storage expandable through the microSD card slot. Inside the waterproof one-piece aluminium housing is a 3,000 mAh battery, as well as 4G LTE support. But the main feature of the Xperia Z1 is a new, 20.7-megapixel camera powered by Sony's 1/2.3" Exmor RS sensor and "Bionz" image processing engine. Paired with the 20.7 MP sensor is Sony's "G Lens", which is an f/2.0 27mm unit capable of "beautiful, sharp and bright images even in lowlight conditions". There's also a Time Shift Burst mode that can capture 61 photos in the space of two seconds, athough there's no mention of the rumored 4K video capture. The Cyber-shot QX10 and QX100 are essentially point and shoot cameras without a viewfinder, designed to be paired with a smartphone over Wi-Fi and NFC. The accessories are complete camera units that come with a sensor, shutter and zoom controls, a microSD card slot, and internal battery, allowing you to snap higher quality photos than what would be allowed from your regular smartphone camera. The QX100 is the higher-end of the two models, packing a 1" 20.2-megapixel Exmor R CMOS sensor, Carl Zeiss optics with 3.6x optical zoom, Bionz image processor, and manual controls for focus and zoom. The QX10 is the entry-level model, which includes an 18.2-megapixel sensor and 10x optical zoom, but it lacks some of the advanced features, modes and controls that are found on the QX100. Both units will work with any iOS or Android 3.1+ smartphones, not just Sony's Xperia range. 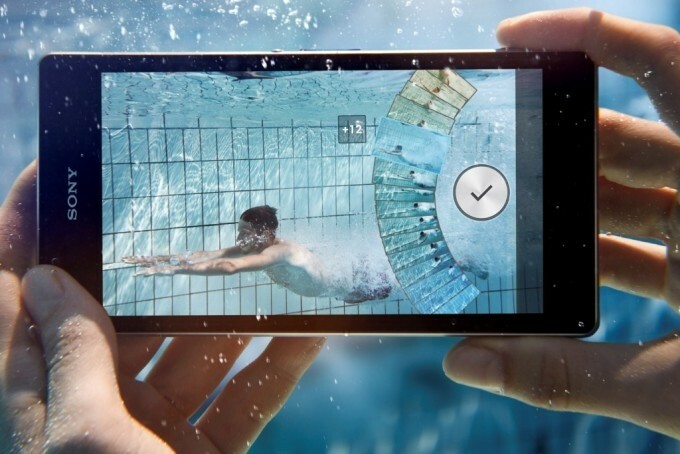 The Xperia Z1 and the Cyber-shot accessories are expected to launch before the end of September. While the pricing for the Xperia Z1 wasn't announced, the Cyber-shot QX10 and QX100 will cost $250 and $500 respectively.